A beer focused venue which has been designed to appeal to women was celebrating success after netting a top industry title. 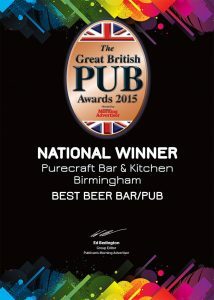 The Purecraft Bar in Birmingham City Centre has been named Beer Pub of the Year in the Great British Pub Awards, taking the title against strong competition in London on 10 September. A large, bright and airy venue, the pub impressed judges with a warm atmosphere and a massive focus on creating a great all round beer offer to appeal to a wide range of tastes. Ed Bedington, editor of the Publican’s Morning Advertiser, which organises the awards, said: “Judges felt the pub offered a lively and fresh new way to present beer and food, adding to the overall pub experience. “Impeccable standards across the board, this is a pub that really stands out in the crowded and popular Birmingham party scene.